A real party animal – the PartyCat power cat is quite the entertainer. This pontoon boat rides well in rough water and during this boat test reached a top speed of around 64 km/h – showing it drives ore like a power catamaran than a pontoon boat. Soft ride and good handling that you expect from a Powercat. Three-burner cooktop with specially fitted barbecue plate, big stainless steel sink and lot of bench space. 55 litre bar fridge, spacious pantry, plus a 60L icebox and even a fresh water shower. Spacious stowage in the walkway hatch and bow bulkhead. Aft lounge can be converted to a full size double bunk. Popular options include an electric anchor winch, shore power, an upgrade to 150L fuel tanks from the standard 100L ones, Megapulse system to keep the house batteries fully charged from shore power and enclosed the bow lounge. Keith Williams is one of Australia’s best known and most successful entrepreneurs. His enterprises are legend on the Gold Coast and in north Queensland, where his name is synonymous with the development of the Southport Spit, Hamilton Island and, more recently, port Hinchinbrook near Cardwell. Today Keith is semi-retired and lives quietlyon the Gold Coast, where a lifetime of boating continues, with regular forays onto southern Moreton Bay in his Powercat PartyCat. Over the years Keith Williams has owned a lot of boats large and small, most of which had some kind of corporate function or another. Little Deal, though, sees light duties only—its purpose in life split between allowing Keith to relax with friends on them sheltered waters immediately north of the Gold Coast, and taking Keith’s much beloved schnauzers, Billy and Barney, out for a run “on a sandbank somewhere”. There are lots of sandbanks in southern Moreton Bay and we were lucky to join Keith for an outing with the dogs on a chilly winter’s day when no amount of creativity would deceive anyone we were on a photo shoot in sunny Queensland. Still, though jewelled green water and sunbaked sands were out of the question, we were left with a particularly authentic opportunity to conduct a ‘real life’ boat test. 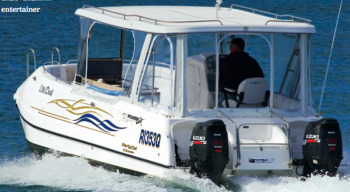 Powercat’s PartyCat is unique in that it serves much the same purpose as the popular pontoon boats as a social vehicle, but it remains absolutely a boat. PartyCats have as much social space aboard—you could realistically call them a floating patio or barbecue area—as pontoon boats. However, when it comes to dealing with rough water, or snugging them up to a pontoon at the back of your home or into a marina berth, they still handle as a Powercat, just with a different deck layout. Which translates directly to a remarkably soft ride across choppy water, and all the manoeuvrability afforded by having twin motors with individual controls. As good as they are at what they do, no-one in their right mind could call pontoon boats soft riding; nor manoeuvrable in tight confines! A pair of 70hp Bigfoot Yamaha four-strokes are the standard power for partyCats. Keith’s history includes many fast cars and fast boats—so he opted for a bit more power than that with a pair of 140hp Suzukis. We ran our usual speed trials with Powercat’s Steve Shaw later that day and recorded a top speed of 34.4 knots. Yes, 64km/h, more or less, in Keith Williams’ own barbecue area! You could easily tow wake toys with it, although you’d have to turn the barbie off. It’d blow out! Little Deal resides at the Southport Yacht Club where Keith can park his roller, literally step aboard through a conveniently sited side entry door and be away. Steve Shaw and his crew at Powercat obviously put a lot of thought into this kind of thing while designing the PartyCat, and it shows. Keith’s boat is optioned with a ’glass hardtop and a set of camper covers, which were very much appreciated on the day. I guess it shows his experience in day-to-day boating that we could be snug in the morning and open up when it finally warmed a little to allow plenty of air flow. weather and still be comfortable. We pulled up at the first convenient sandbank to let Bill and Barney loose and of course, it being the Coast, we didn’t have to go far for that. A telescopic ladder on the PartyCat’s square bows made it easy for Keith to disembark. What seemed to be his usual game with a pair of hyper excited pooches ensued. They were easily able to get onto the foredeck through a door in the bows and pranced about all atremble until let loose. The PartyCat’s catamaran hull showed itself a winner again when Keith poked the bows firmly up onto the beach while the props stayed out back in deeper water. With those frisky Schnauzers out of the way for awhile, I was finally able to take a look around inside. The PartyCat’s helm is found to starboard with a lengthy galley unit along the port side and U-shaped lounges bows and stern. In Keith’s boat, the stern lounge was inside the shelter of the camper covers and the bow lounge was left out in the open. Powercat have options that allow the bow lounge to be enclosed if you wish. At the helm, you find yourself driving a boat at a side console with all the instrumentation and controls you’d expect where you’d expect them to be. The only thing unusual about the side console is that it incorporates a sizeable head with a flushing toilet (a 40L effluent tank is standard) and small handbasin. They’re features ladies aboard will appreciate. A few units I’ve stayed in couldn’t boast a galley as well equipped as Keith’s PartyCat. A three-burner cooktop (with specially fitted barbecue plate), a big (square) stainless steel sink and enough bench space to prepare food for several guests stretches right along the port side. Glass tops that fit on the sink and stove increase bench top space when these are not in use. The sink has pressurised water (a 35L hot water system is optional) supplied from an 80L freshwater tank. Below the galley bench top, there’s a 12/240V 55L bar fridge, a cutlery drawer and spacious pantry, plus a 60L icebox. Aft, a pedestal drops in place to convert the aft lounge to a dining area and aft of the lounge again, a short walkway reaches a fold down ladder set between the outboards. From here there’s easy access to and from the water if you can’t find a beach to swim at. A hatch in the walkway opens to a spacious stowage area below decks. Similarly, there’s a hatch in the bow bulkhead accessing another spacious locker. An extendable freshwater shower head hides away in the bow walk-through. The aft lounge can be converted to a full size double bunk if you wish and other popular options include an electric anchor winch, shore power, an upgrade to 150L fuel tanks from the standard 100L ones, and a Megapulse system to keep the house batteries fully charged from shore power. The PartyCat has a practical application for people seeking ‘Gold Coast lifestyle’ boating—wherever they may live! The test boat was powered by two Suzuki 140hp four-stroke outboards.